Just prior to CES, Qualcomm hosted us at a small event in Las Vegas to benchmark test its new Snapdragon 855 processor. There were breakfast sandwiches (pretty good!) and coffee (eh). What follows are benchmark scores. This is a pretty straightforward post. The Snapdragon 855 is a significant refresh over the outgoing 845, with Qualcomm claiming an impressive 40% gain in CPU performance this year. There's a new, marginally faster GPU, new DSP/AI core, more capable image signal processors, and a Snapdragon X24 LTE modem with the X50 5G modem being optional. You can read all about the 855 in our original post on it here. 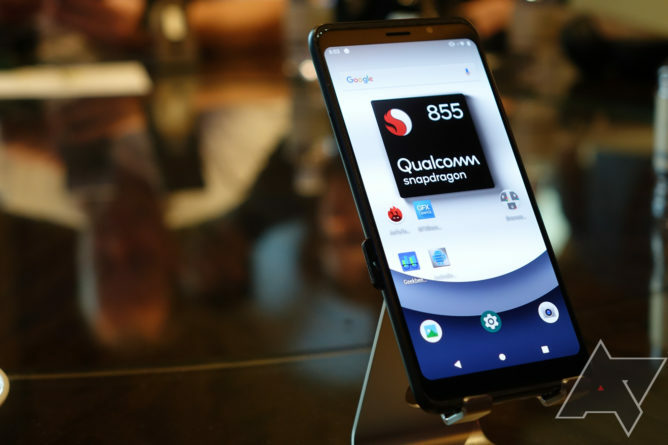 Qualcomm's 855 reference design is meant to look, feel, and act like a modern high-end smartphone, and it largely does. Sure, the design is slightly less refined than what Samsung's turning out these days, but it's hardly some kind of purpose-built heat-dissipating brick. It's basically a phone. And that's because Qualcomm wants the performance in the testing here to be reflective of what the chip will do when it's actually in retail hardware later this year. 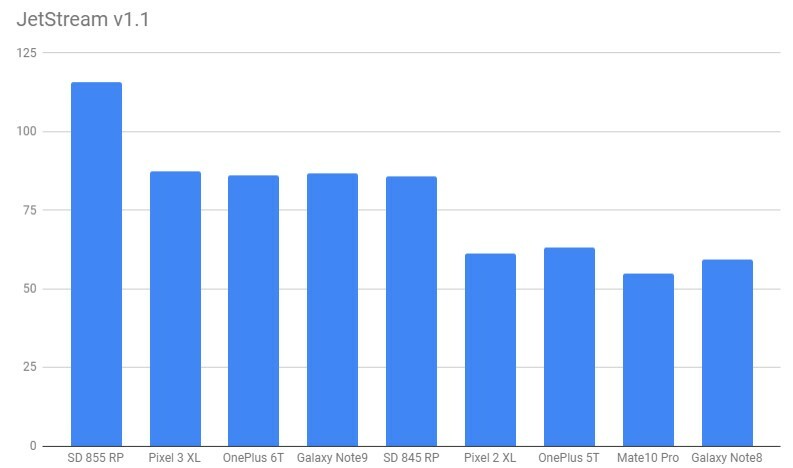 Testing was done using the same kind of benchmark apps you'd find on the Play Store, minus the fact that Qualcomm's versions are all modified (these modified APKs are provided by the benchmark developer) not to connect to the internet. 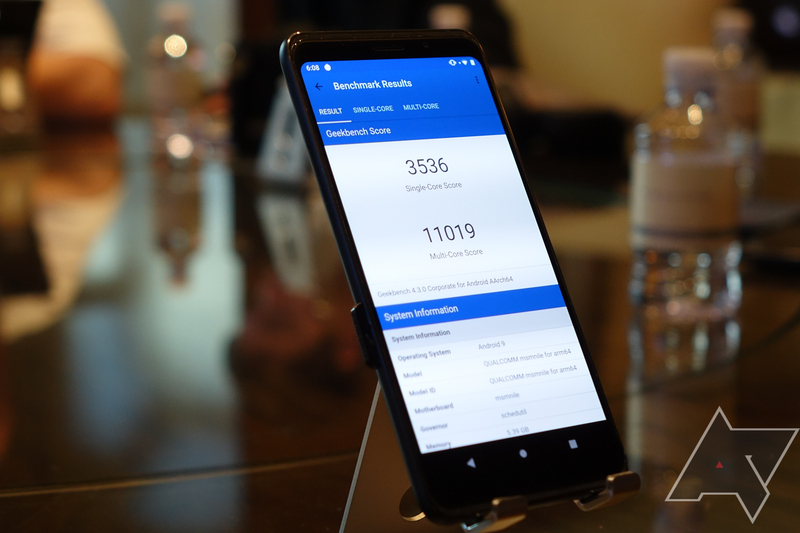 Qualcomm also has conducted its own testing of these benchmarks internally, and provided us some score ranges as a reference in the event we encountered any abnormal results. During my own testing, I saw no results that deviated outside the expected range. The raw results are here in nearly-unreadable table form for you to peruse. I'd suggest moving on to the visualizations, though, and referring back to these after the fact. First up is the well-known Geekbench suite, version 4. This test is a synthetic benchmark designed to measure raw CPU performance. 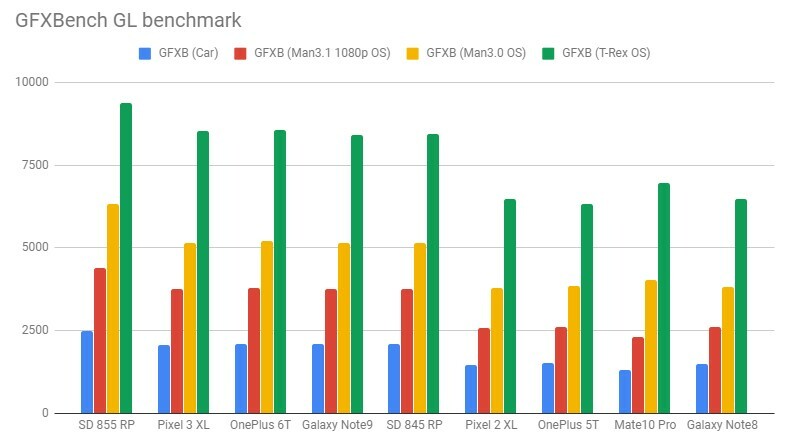 GFXBench contains a variety of Open GL ES 3.1, 3.0, and 2.0 graphics benchmarks. The tests are listed in descending order based upon their complexity, starting with the newest benchmark which tests advanced GL ES 3.1 features. These are all "offscreen" tests, meaning all were rendered at the same resolution regardless of the device's actual, physical resolution. 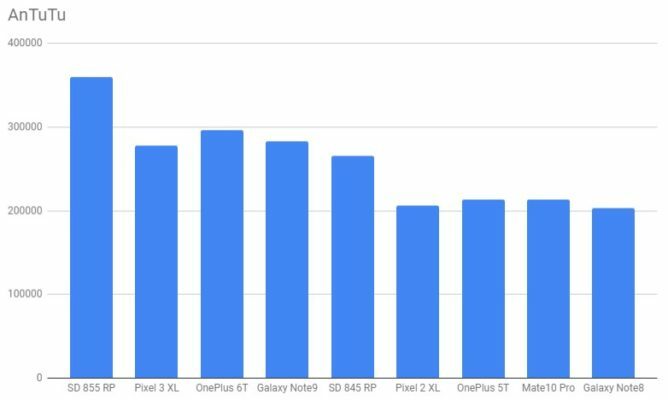 AnTuTu is a holistic benchmark that combines things like storage speed, RAM, GPU, CPU, and other performance into a single score. While it's not the most helpful in this sense (after all, who knows what kind of storage Qualcomm's reference platform utilizes), it's a very commonly-used benchmark and at least worth throwing up here. For those deeply concerned with single-core Geekbench scores, the Snapdragon 855 is without a doubt the most promising chip Qualcomm has released in years. 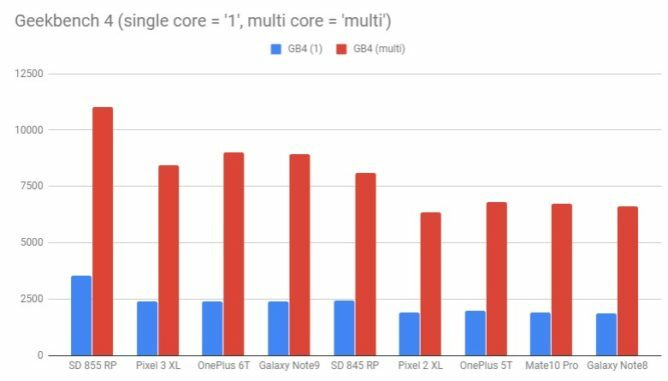 With its odd 1:3:4 CPU layout (one very big core, three big cores, four small cores), it seems Qualcomm - or as I'll discuss, ARM - has been able to close at least some of the gap it has traditionally been criticized for in comparison with Apple's chips. 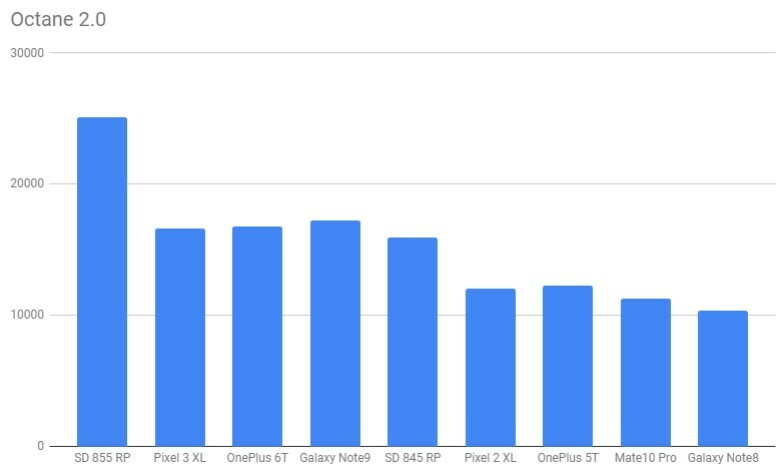 GPU performance seems more marginal in terms of improvement, though Qualcomm's Adreno chips are so far ahead of what Intel, Huawei, and MediaTek are able to package in this kind of power envelope that it's really just another extension of that lead - Qualcomm's operating a full generation or more ahead of the competition there. The elephant in the room on the CPU side is Huawei's Mate20 Pro, which has seen its benchmark scores delisted by a number of sites due to allegations of "cheating." While we're not going to get into the politics of all that, looking at the scores that are out there, it does appear Qualcomm's new A76-based design holds a very slight speed edge over Huawei's own A76-derived Kirin 980 (we're talking sub-5% differences, though). That does tend to disillusion me toward any kind of narrative Qualcomm is pushing about its CPU being especially special, given Huawei's off-the-shelf A76 design appears to perform very similarly. That makes it pretty clear ARM is the one driving the performance gains here, not Qualcomm. Any major real-world performance differences would then come down to optimization and increasingly common heterogeneous workloads that leverage not just the CPU, but the GPU and DSP (aka AI/neural/ML processors) on our phones to accomplish more complex, specialized tasks. Given Qualcomm's leadership in the mobile GPU space and the constant growth of the Hexagon piece, I do think they're adding value to the equation there that competitors can't boast quite so loudly about. But, overall? Newer chip is faster than older chip. Not surprising.